Note: Finding Ithaka is a participant in the Amazon Services LLC Associates Program, an affiliate advertising program designed to provide a means for sites to earn advertising fees by advertising and linking to Amazon.com. This is my first post using affiliate links, so I want to explain them. If you click on any of the links below and make a purchase, I will receive a small commission. It doesn’t cost you anything. I will only link to products that I use myself and that I think you would love. I truly appreciate you using them and supporting me, if you are planning to make a purchase anyway. If you don’t want to use my affiliate links, you can just search for the products I talk about without clicking on my links. 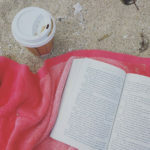 It wasn’t until I sat down to write this post that I realized all the books I read this month are about strong women, or written by strong women. And that made me happy. Lilac Girls is a fictional account of three real-life women who lived through WWII. Caroline Ferriday, a French woman living in New York, is busy sending care packaged to orphans in France and providing whatever support to the war effort she can. Kasia Kuzmerick is a Polish teenager sent to Ravensbrück concentration camp for women in Germany, where she was used in gruesome experiments. What I thought was most interesting about this book was that it also told the story from a third kind of person’s perspective who we don’t often hear about. Herta Oberheusers a real German Nazi doctor who performed gruesome experiments on 86 women like Kasia, who Kelly fictionalized in her novel. If you are a fan of WWII novels, I think you would love this book because it gives you the perspectives of people not often written about – Europeans in America and Nazi doctors. But if you are not as into WWII books, I would probably recommend other books before this one, like The Nightingale, Salt to the Sea, or Unbroken. I was especially interested in the perspective of Herta, hoping to get an insight into how she rationalized what she did or dealt with her emotions about it. I thought that this was where the book fell flat. I wasn’t able to feel any sympathy for her, she creeped me out, and she showed no remorse for what she did. However, after I tried to look up more information about her online, I discovered that she really had no remorse for what she did. I came to realize that the author really did the best job possible with her, but it just wasn’t as good as I was hoping. She writes in her diary that she wanted to use her writing to have a meaningful impact on the world long after she was gone. She wanted people to read her diary and to understand that fear and hate lead nowhere because she knew that even after this war, people would forget. I hope that wherever she is right now, she knows how many people have been impacted by her diary. I hope that we can honor her memory by standing up to hatred and ignorance and by remembering what she endued. 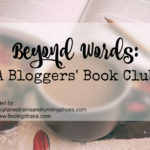 I first read about The Girls on Lauren’s blog when she linked up this post to our book club linkup last month. Immediately I knew I had to get my hands on this book. It is about a woman looking back on her life as a teenager who was sucked into a Mason-like cult in the 60’s. How she got there. How she escaped. How it affected the woman she became. This book is about so much more than a cult. It’s it’s about girls, the way we are raised, the way we are viewed, the way we are seen and not seen. I gave this book 5 stars and I can’t recommend it enough. Lindy West is a talented writer, fierce feminist, and advocate for the fact acceptance movement. Her stories about her life growing up as a fat person and trying to find her way in a world that is hostile to fat people was very moving to me. Her book made me think a lot about the way that I have judged people without knowing their story. I think that alone makes this a worthwhile book. However, I should warn you that this book is not for everyone as she speaks forecefully about some hard and controversial topics. I've put myself on a mission to read everything that Neil Gaiman has ever written. One afternoon when I wanted something lighter to read, I picked this up and read it in a few hours. It's a children's book about Coraline, a young girl who saves her parents from her "other mother," who lives in an alternate reality through a doorway in her house. It might be a little bit creepy for certain children, but I loved this book because it is about a girl who is brave when she is scared. It's about a girl who saved her parents. It's about confronting your fears and doing what is right, and that's a great story for children to read. Margaret Atwood is a queen. I love her dystopian worlds and her insight into where we might be are headed. In Oryx and Crake, she imagines a not so far fetched world where corporations have genetically engineered humans, animals, and foods to the point complete destruction. Snowman is the last human on earth and takes care of a group of genetically engineered people who are sort of like humans but not really. He tries to make sense of what happened, of his friend Crake, who created these genetically engineered people, and of the mysterious woman he loved, Oryx. Through a series of flashbacks, we see how the world ended up destroyed, and through his present actions, we see the results. I really want to read Lilac Girls! I just need to find the closest bookstore, which has not been easy! I read it on my Kindle otherwise I totally would have sent it to you! I hope you find it. I think you would like it a lot. How is the base library? It literally blows my mind that Herta had no remorse for what she did! I just can’t imagine doing those horrible things to an animal let alone a human being! This was such a good book, but I’m glad that we don’t have another WWII book for next month! I think that I need a break! I was waiting for another chapter for Herta to come but the end kept alternating between Caroline and Kasia. I was like, so Herta had no remorse? That’s it?? I understood how she fell into working at the concentration camp and in the beginning of the story I felt bad for her because there were no opportunities for women. But even then she seemed kind of selfish and arrogant. I need a break too from WWII books. I love them but I’ve been reading too many lately. But I’m glad we read Lilac Girls. I think The Lilac Girls is already on my list, but I’m adding The Girls and some others now! I didn’t even know Coraline was a book! Oh I think you would love The Girls. It’s such a great book. I remember going to see Coraline in college and becoming obsessed with it, but I never really read for pleasure in college. Lately I’ve been on a Neil Gaiman kick so I had to read this when I needed something light. It’s a cute book and I especially loved how everyone keeps getting Coraline’s name wrong and she keeps having to correct them – story of my life. The Lilac Girls and The Girls sound great! I’m definitely going to try read them both. I think you would like both of these books but especially The Girls. I can’t recommend this book enough. I also couldn’t believe that this was Emma Cline’s debut novel. I can’t wait to see what she writes next. Lilac Girls sounds interesting. I am curious to know what you think of using affiliate links from Amazon. I have been thinking of doing it. I will definitely let you know, or maybe even write a post about it! I have been blogging for 2.5 years but never really thought about making money off of my blog. But Hawaii is expensive and it’s hard to get jobs here so I’ve been trying to think of ways to organically grow my blog and maybe make some money too. I don’t want to start doing tons of sponsored posts about random things because I think that dilutes your blog, and my blog is so much more important to me than making a few hundred dollars on a random post. But I figure, if I’m writing about books anyway and linking to Amazon anyway, I might as well add affiliate links. I’ve heard amazing things about Lilac Girls! I am definitely going to check it out. It’s a beautiful book! Get the tissues ready. Like, a whole box. Thanks for the shout out! I’m so glad to hear that you enjoyed The Girls! I’m going to have to add Lilac Girls and Coraline to my list. Thank you so so much for the recommendation! I read it in about a weekend it was so good. Lilac Girls was amazing, just make sure you have a box of tissues next to you. The Diary of Ann Frank is definitely something I would love to reread as an adult. Your review of The Girls is the first one that has me a little bit interested… the whole cult concept of it has never appealed to me. 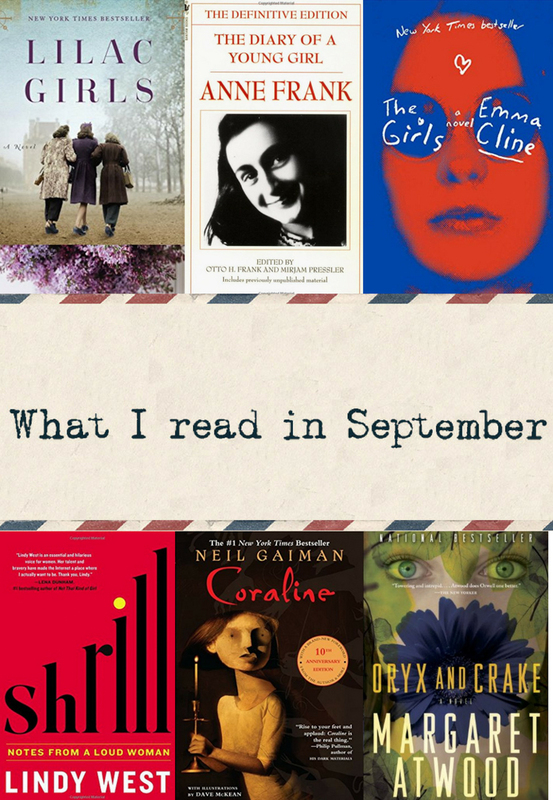 I’ve never read anything by Neil Gaiman, but another blogger I love always talks about loving his books too. From what I’ve seen, it seems like people are really divided on The Girls. Some people absolutely love it & give it 5 stars on Goodreads. I have always been interested in cults, so as soon as I knew what the book was about, I wanted to read it. Other people really hated it or felt like it didn’t lie up to the hype. If you read it I will be curious to know what you think! I don’t know why I keep reading WWII books, but they are so good. I wish Anne Frank lived, too. She had so much to offer the world and was just such a beautiful person. I had to keep reminding myself how young she was when I was reading her diary because she had so much wisdom and was such a great writer. Whenever I read about people dying right before the war was over, it makes my heart break even more. She was so close. She even managed to stay hidden for most of the war. Lilac Girls was hard to read at times but I did like it a lot. I liked reading about different perspectives that you normally don’t get in WWII books.